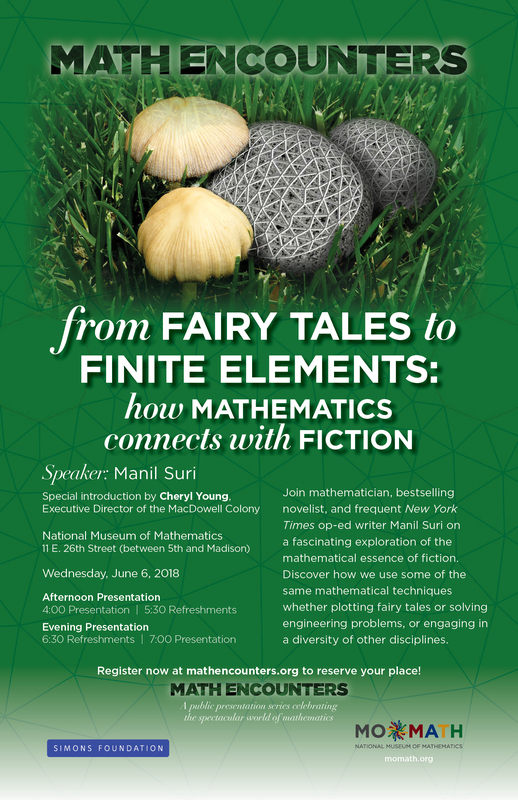 Join mathematician, bestselling novelist, and frequent New York Times op-ed writer Manil Suri on a fascinating exploration of the mathematical essence of fiction. Discover how we use some of the same mathematical techniques whether plotting fairy tales or solving engineering problems, or engaging in a diversity of other disciplines. Special introduction by Cheryl Young, Executive Director of the MacDowell Colony, an artists’ colony that has supported winners of at least 79 Pulitzer Prizes, 781 Guggenheim Fellowships, 100 Rome Prizes, 30 National Book Awards, 26 Tony Awards, 24 MacArthur Fellowships, 9 Grammys, 8 Oscars, and 8 National Medals for the Arts. Please note: this presentation is designed to be accessible and engaging to a general audience. As a rule of thumb, it would be best enjoyed by participants ages 12 and up.